Born in 1924, near Puvirnituq. Encouraged to carve by James Houston during one of his visits to Puvirnituq in 1950, Ivilla is best known for his fluid depictions of Arctic wildlife. A talented carver from the onset, Ivilla’s first carving, a bird, was sold for five dollars, which was considered a high price at that time (Myers [Mitchell] 1985). Wildlife, in particular birds, hunters, and narratives. One of a handful of artists involved in the beginning of formal sculpture production in Puvirnituq, Ivilla is acclaimed for his realistic portrayals of arctic animals and hunting scenes. His work has been featured in some of the most groundbreaking exhibitions of Inuit art (such as the touring show Inuit Sculpture, which was circulated by the Smithsonian Institute in 1979) and is included in notable collections such as those at the National Gallery of Canada, the Winnipeg Art Gallery, the Royal Ontario Museum, and the Canadian Museum of Civilization. By the time Peter Murdoch arrived to manage Puvirnituq’s Hudson’s Bay outpost in 1955, Ivilla’s work was already well known and could be described as “highly accomplished” (Wight 2006: 130). His faithful depictions of birds were particularly sought after, and, in his later years, Ivilla concentrated mainly on their representation. 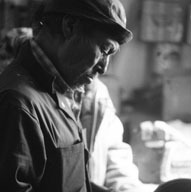 A pivotal figure in the development of carving in Puvirnituq, Ivilla recalls that he and Charlie Sivuarapik were “maybe the first people to ever sell a carving to the co-op when it was incorporated” (Myers [Mitchell] 1985). In 1963, Ivilla indicated in a letter to Twomey that he was carving infrequently, partly because of the lack of remuneration (INAC 1997), but also because of the poor quality of stone available: “The stone used now by Eskimos [sic] here is not good. I do not enjoy working poor stone. . . . The White people will soon refuse our carvings if we use poor stone. I am not doing much carving now . . .” (Swinton 1972: 24). By 1972, Ivilla had ceased carving altogether and instead began working as a full time superintendent for the local school. 1985 Interview with Sarah Joe Talirunili and Samisa Ivilla, translated by Aliva Tulugak. 1972 Sculpture of the Eskimo. Toronto: McClelland & Stewart.